I wasn’t going anywhere, and it’s raining, so I didn’t half the twists. I love the definition and shine, but babyyyyy, that red hair has GOT to go. I’m going to prep a henndigo mix before bed, ’cause I’m not having that. My nickname may be WildChild, but no need to be on fire. I know I’m late but I just had to say that this twistout is the bomb. Keep up the good work chica! I have a color question. Is it safe to use henna over previously colored hair? And do you know if it covers gray well? Thanks! Yes, you can henna over dyed hair, but make sure it’s body art quality henna. Compound hennas can contain metallic dyes and cause breakage. It does cover greys, but some have said that it leaves them kind of a bright color. Uh uhhh!! Imma need you to stop with that hair. 😛 lol. Pretty!! I love it. Its gunna be sad to see the red go….but I wanna see what you shall color it next! Brown? Black? I just did a henna/indigo treatment to tone down the red. I’m not using actual dye on my hair again. It’s like an auburn brown now. Hi, I actually like the outcome of your hair. You have nice thick hair, the curls are big but I think it will loosen up in a couple of days. See unlike me I like big messy hair. And actually I like the red on you I was going to ask you some advice for coloring my hair. I like big hair too, if I had worn the style out I would have separated the curls…but I didn’t want to sleep on them after I had mussed them up if there was no reason for me to do that. I already did my henndigo last night and am wearing a wash n go now. I have videos up about how I colored my hair and what I did – the red is mainly from henna. Hth! hahahaha, girl you are crazy, you keep me laughing…don’t change the red hair, I think its so cute on you:-). But I do understand, I can’t stand black hair on my head. Your blog is too cute and very informative. Looking forward to seeing your other posts. Oh quick question…what do you do with all the other hair products you don’t like? *please don’t say you throw them away* b/c I’d gladly take them off your hands:-)…at least the glycerin free products, lol. I never throw anything away! Ever! I think that is wasteful. Funnily enough, I don’t have a lot of products that I dislike to the point where I don’t want to use them at all again, but the few that I do I save for local meetups ’cause we swap products there. I hate going to the post office so I never put stuff up on the swap board…lol. Wow! beautiful! 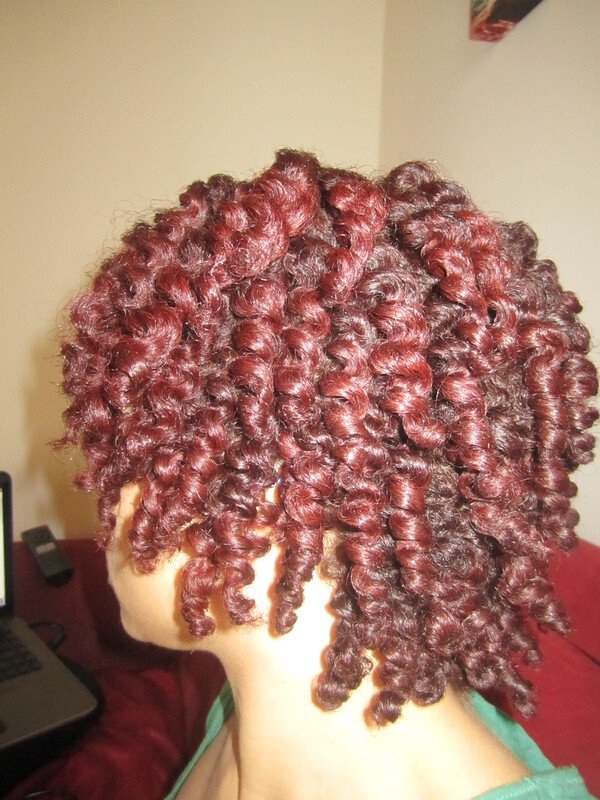 you might be perfecting the twistout!!!! LMAO! I saw that pic again and got so mad! I have the mix in my hair right now!!! 1/4 henna 3/4 indigo. Ok dang, how did u twist all that hair in one hour?! my sis has been natural for 3 years and doesn’t have half ur thickness, and it takes her 2.5hrs everytime. Izzy looks voluptuous, like she just put on VS plumping lip gloss, but for hair! Ok that was weird. LOL!!! I would tell you about the time I tried plumping gloss but that’s another story bwhahahah…It was a lot easier to do on dry hair that had already been twisted b/c it was still fairly detangled…I just put like a quarter size amount of condish on each section (not each individual twist) I made and did about 3-5 twists per section. Thanks…but you’re supposed to have my back, lol! Come on, Cass! I just don’t like how unnatural it looks…like that is CLEARLY not my natural color…smh.